tl;dr: We cut the data again, and it paints a picture of venture capitalists being even more boring than we thought. There’s also the hard partying lifestyle of Jordan Belfort and the vintage pinstripe-laden wardrobe of Gordon Gekko. In contemporary VC culture, though, appearance is often a pastiche of the worst parts of casual Friday and business casual: unfitted button downs, khakis, some kind of wacky sneakers, and a fleecy vest, preferably from Patagonia. The same can be said of entrepreneurs, many of whom have a penchant for wearing startup tee shirts, hoodies, and jeans basically everywhere they go. To put a fine point on both aesthetics: It’s kind of frumpy. Silicon Valley Fashion Week was a bust. The question is, though, does this affect investing behavior? Not the clothes per se, mind you, but the vest and the need for it. Do VCs invest more or less when it’s “vest weather”? Do entrepreneurs have better luck when it’s hoodie season? 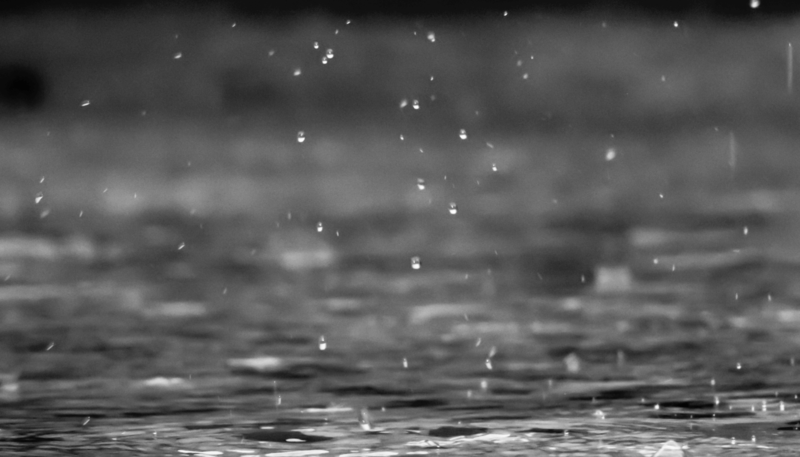 In other words, does the weather influence investing behavior in the venture capital market? Why might this matter? In many sectors, business activity is seasonal. Sometimes, this seasonality is driven by actual seasons. For example, new housing construction is slower in winter months, a well established trend since the early 2000s. Warm weather can have a positive effect on consumer spending and sunny weather produces significantly better performance on major US stock indices. Perhaps startups from different regions have better luck than others depending on the weather? Let’s find out. What did we find? 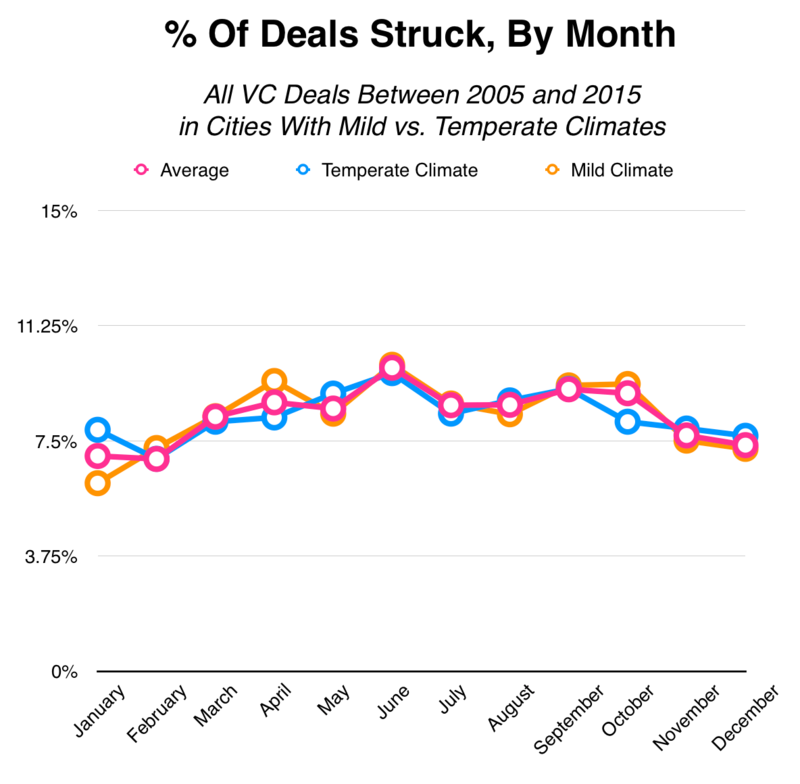 Startups in cities with temperate climates (with four seasons) have a similar pattern of fundraising activity as those from more mild climates. So needing to wear a vest (or sweater, or, in the cases of Boston, NYC and Chicago, a full-blown parka) for a certain part of the year doesn’t have a huge effect on whether investors are biting. There are slight variations, but nothing significant. Startup fundraising activity in warmer climes appears to ramp up faster in the spring and levels out through October, whereas startups from temperate climates experience a slightly slower climb through June and decline thereafter. But, again, any deviations from the national average are not significant. But at least in this initial analysis, startups from harsher climates don’t tend to fare much better or worse than those from milder ones, at least when compared to the national average. It’s regional affiliation and proximity to major startup hubs, rather than climate, that has the most effect on startup fundraising activity. What to take away from this? Regardless of whether your startup is based in a warm or temperate climate, the amount of funding activity in your region is not going to differ from the national average over the course of the year. Like we said earlier this week, you might have a slight advantage when raising in the spring and early summer, but it won’t give you much of an edge. The same suggestion we had earlier this week still stands: Regardless of where you’re from, it doesn’t really matter when you raise.